Search Engine Optimization has always been much popular among digital content creators. The second most important thing for a website is to optimize it for the Search Engines. The first thing is obvious to create the website itself 😀 . Looking at the need of Search Engine Optimization here i have some tips to offer regarding the same. 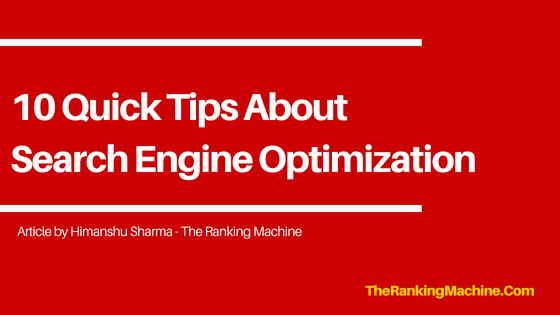 These are some basic tips which you can follow to Optimize your website and content for Search Engines efficiently. The foremost thing with adding more content to your website should be the keyword research. Keywords are the base of any Search Engine Optimization campaign as it directs the path and strategies to be used. Conducting a complete research for certain keywords in your niche is always recommended and is must to be performed. The home page of your website should be optimized highly for your Original and Unique Brand name. This way people would land on the home page while searching for your brand. All other pages should have their own specific keyword(s). Routing the traffic from your popular posts to other posts. Passing on the link juice to another page. Trying out with Anchor Text Optimization. Lowering down the Bounce rate. Keeping your site well networked. The anchor text that you choose can be your primary or secondary keyword for the linked page. Use variety of Anchor texts and don’t just get fixed with a single one. Use them only when there is a need, don’t just force interlinks in every another paragraphs. Another thing that can be done is to let the links open in another tab. This will surely help you to optimize the content according to a perfect structure. It is easier for the Search Engine Crawlers to move throughout your website. They are the links which go from your content to another related content. Outbound links are used to attach some related content from another website in between your own content. There is no actual benefit but it always increase your reliability as a content creator. Internet is all about sharing information in whichever form it is available. And when you link a content which has some added information in the related field it adds up to your site trust factor and also to user experience factor. Your page title would be the first thing that attracts the user. They will only come to visit your webpage if the title should catch their attention. Their is Honeymoon period for Google search in which a new quality content is boosted in Search Results for some period of time. If it gets enough attention than surely it takes the place. That is the period which you can try out your skills. If your page title would be eye catch and attractive then users will surely click to open up and read it. It should always have a nice character length, 70 characters is the limit for Google search results or else it will be trimmed with dots. Primary and Secondary keywords should be used in the Page title making sure they are required there. Don’t let the visitors feel that they have been cheated with fake and misleading titles. The Slug is the address of your web page on the Internet. Each of your web page will have a unique URL that resembles the address of that page. It plays a crucial role in Search Engine Ranking and your primary keyword should always be used in the URL. Only reason to neglect keyword in URL is when it looks bad or you are using Long tail keywords with 6-7 words. It is advised not to use numerals in URLs but they can be still used if necessary. Using short and precise URL is better than using long URLs at first. The content of your page is divided in various parts. Content including Headlines, Digital Media, Paragraphs, Bullet Points, Lists etc. A piece of content having more than 1000 words is considered as a Good Content. Not only the count of words but the information it presents and the way in which it presents also matters. Content is always considered the king in the Search Engine Optimization process. It is the major thing which is promoted through the campaigns and all. Having a call to action theme is suitably perfect if you are selling a product or service on your website. The content can actually make or break your blog in various ways. Your primary keyword should be used in the article precisely in Headings and also in text. Don’t just stuff the words and come with a natural and high quality content that delivers. The word meta means Information about Information. Therefore Meta Description actually describes the topic of your content. Yoast SEO plugin allows you to add Meta Description for each of your page individually. Your primary and secondary keywords should be added in the description without making it look bad. The Meta Description should be always brief and up to the point. Google Search results only shows 160 characters of the description and thus you should use characters ranging from 140 – 160. There is no point of providing information if it doesn’t reaches your audience. By letting your visitors share your post you intend to get more and more targeted visitors. There are multiple plugins available which allow you to add floating share buttons in your website. The share buttons when clicked shares the post on the respective Social Media Platform. Also add social share buttons below your posts or on the starting. The readers can be asked to share the content if they really liked it. Social Media presence will affect your overall Search Engine Optimization results. You will always hear that Google loves posts and articles with 1000+ Words. But do you think people love to read that much information at once? I don’t think anybody is good with reading long long articles and its not even productive. We can make both Google and the Readers happy at once by using Bold and Italics text formats. Bold words are highlighted and thus catch the attention of the user instantly. Use bold text formatting with important information so that the reader gets only what he needs. Italics is basically used to emphasis a part of text to get more attention towards it. You can write Instructions in Italics format so that they can be focused easily. It is never too easy to get comments from your readers. Most of the people just read the information you have provided and get back to its use. But getting comments and feedback do increase your trust factor and authority among others. Organizing contests to have some good comments. Always use spam check plugins and never allow any spam comment to ruin down your page quality. Comments will start to come in a gradual way and will take some time to make a continuous flow of healthy comments. There is always a debate about Website Speed being a factor which decides the ranking or not. Although there is no proof that it does but still optimizing your Page Loading Speed will always help you. Taking user experience as an instance more than 60% readers will not wait for more than 3 seconds of loading time for your page. This shows the need of optimizing your page load speed and making the site smoother. Remove any additional script or styling that is making the site look heavier to load. These were some tips for your Search Engine Optimization campaigns at beginning. By taking care of these points you will surely get positive results and higher Search engine Rankings.